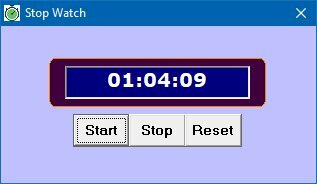 We can design a stopwatch that resembles a typical digital stopwatch.In this program, you need to insert one label, three command buttons and a timer. The label is used as the display panel. The buttons are use for Start, Stop amd Reset purpose. We need to write suitable code for each of these buttons. Set the timer1 interval to 100 which is equivalent to a tenth of a second.Besides that, declare three variables t, s and m to cater for a tenth of a second, second and minute display. We have also created a subroutine known as displaytime()to diplay the time. 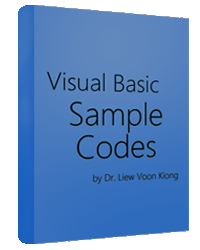 LblDisplay.Caption = "00" + ":" + "00" + ":" + "00"